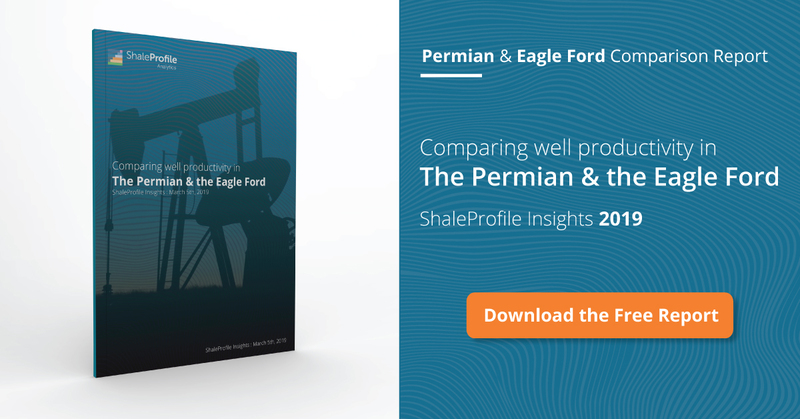 This interactive presentation contains the latest oil & gas production data from all 21,912 horizontal wells in the Eagle Ford region, that started producing since 2008, through October. Oil production increased slightly in the Eagle Ford in 2018, as operators completed ~10% more wells than in 2017, based on preliminary data. Once revision data is in, I expect that October production will be close to 1.3 million bo/d. Gas production from these wells is good for almost 6 Bcf/d (toggle ‘Product’ to gas to see this). Average initial well productivity almost didn’t change year-over-year, as you’ll see in the ‘Well quality’ tab. If you click there on 2018 in the legend, you’ll note that the wells that started last year are so far closely tracking the performance of the 2017 wells. Although newer wells are peaking at more than double the rate than wells that started in 2011/2012, they are also declining faster. I expect that after 2-3 years on production, they have declined to a very similar production rate as those earlier wells had at that age. That becomes especially apparent if you select for example just the wells from 2012 and 2016 (keep the ‘Ctrl’ key in when selecting both of these years), and if you change the axis to a linear scale. I’ll show you more about these decline rates later in this post. Of the top 5 operators in the Eagle Ford, only the 2 largest (EOG & ConocoPhillips) set new production records in September. In this “Ultimate Recovery” overview, the relationship between production rates and cumulative production is revealed. Wells are grouped by the quarter in which production started. I’ve preselected the Austin Chalk and Eagle Ford formations. As I showed last week for the DJ Basin, also here you can see that the decline steepens once wells have reached low levels of production. Here the performance is shown of all the horizontal wells in the Eagle Ford, that started production between 2011 and 2014. Only wells are selected that have produced predominantly oil, and which fell below a production rate of 60 bo/d not later than Nov 2015 (this ensures that we have at least 36 months of data for all wells), from which they never recovered. There were 5,628 such wells, from in total 11,554 horizontal oil wells that started in the Eagle Ford in those 4 years. The top chart shows the oil production rate (logarithmic scale) of these wells, by the month since they fell below 60 bo/d. The wells are grouped by the year in which they started. 1) After annual decline rates have slightly stabilized (after month 26 or so), you can see that the annual decline is close to, or above 20%. 2) Each year, the annual decline rate is higher. Some of this is expected, as younger wells are in an earlier part of their decline curve, where the decline is steeper. But even if you correct for that (e.g. by comparing the performance of 2 consecutive vintages shifted by 12 months), the decline rates of younger wells are higher. In particular, the wells from 2014 never really go below 25% annual decline. 3) Once wells reach a very low production rate (~10 bo/d), the decline rate accelerates again. A special thank you to Mike Shellman for sharing a wealth of articles and oilfield knowledge regarding this topic. Next week we are at the NAPE summit in Houston, so if you happen to be there, please come visit our booth (#2331). We also still have time available earlier in the week for 1-on-1 meetings in Houston, so please contact us if you’re interested in understanding how we might help you. Tomorrow at 10:30 (EST) we’ll also cover the Eagle Ford in our enelyst chat. Later this week, or early next week, there will be a new update on the Permian Basin. I am beginning to see discussion of “managing the plateau” with regard to the Eagle Ford and Bakken. COP discussed this in their conference call, as did HES. In summary, the idea is to stop growing production in order to not have to build out infrastructure any further. COP says they can still grow in EFS, not in Bakken. HES is targeting large growth in Bakken to 2021, then trying to hold there 4-5 years. It appears Bakken and EFS growth may be limited in the future, absent and EOR breakthrough. Will be interesting to see how many others discuss “managing the plateau” in conference calls later this month. 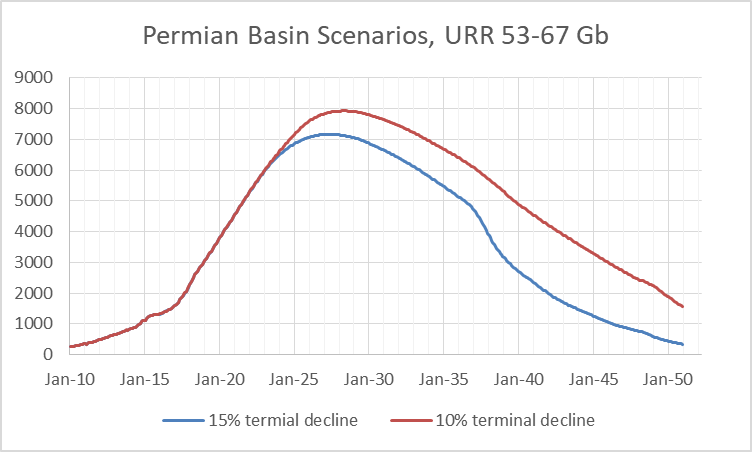 I did a quick comparison of Bakken and Permian for terminal decline using all oil wells. For Bakken 2010 to 2012 wells from month 49 to 70 the trendline on natural log of output gives a 14% exponential annual decline rate. For Permian 2011-2012 wells from month 49 to 70 the trend line on natural log of output results in a 16.3% exponential annual decline rate. It would probably make sense to assume a terminal decline rate of about 15% for the Permian and Bakken and perhaps 20% for other plays. The decline rate isn’t constant over the remaining life of a well after e.g. 4 or 5 years, and it isn’t constant by vintage. There appear to be risks on the downside (higher decline rates). Note that in the terminal decline dashboards the starting point for all wells is roughly the same: Month 0 is the last month for each individual well above the given production level (I used 60 bo/d here in this post, 40 bo/d in the previous post). I don’t speak for Enno but believe he has done an excellent job of qualifying his objective in studying late-life well performance at certain time and rate intervals. It is clear, at least to me, the focus is not on population averages. Terminal decline rates clearly have ramifications to the EUR/UR relationship and affects when wells reach economic limits, which by the way, are achieved for a host of reasons other than just “price.” If the rate of decline exponentially increases as the well gets older that is important and has implications toward DCA generated type curves, debt to asset ratios, reserves and the overall financial plight of the shale oil industry and its ability to deliver all the absurd growth predictions people like to haphazardly throw around. I am unclear why you would wish to change the objective of terminal decline discussions. Perhaps you should consider creating your own data for your own needs. As to your personal jibe at me; after 40 plus years of making a living producing oil and natural gas I understand fully that good wells must pay for bad wells. That has not occurred in the decade the shale oil industry has been hammering away at unprofitable wells and, of course, is precisely why it is unable to deleverage long term debt and must still rely heavily on credit for its survival. Data is just data unless you know what to do with it; the amazing thing about Enno’s work, for me, is the insight into economics and financial plight of the US shale oil industry it provides. Its a business, shale extraction, and it must be profitable to be sustainable. It could be my eyes, but from your chart (terminal decline rates) it looks like the oldest vintages have more “stamina”. It will be interesting to see if future work/updates could strengthen this “stamina”trend. Enjoying all the comments. 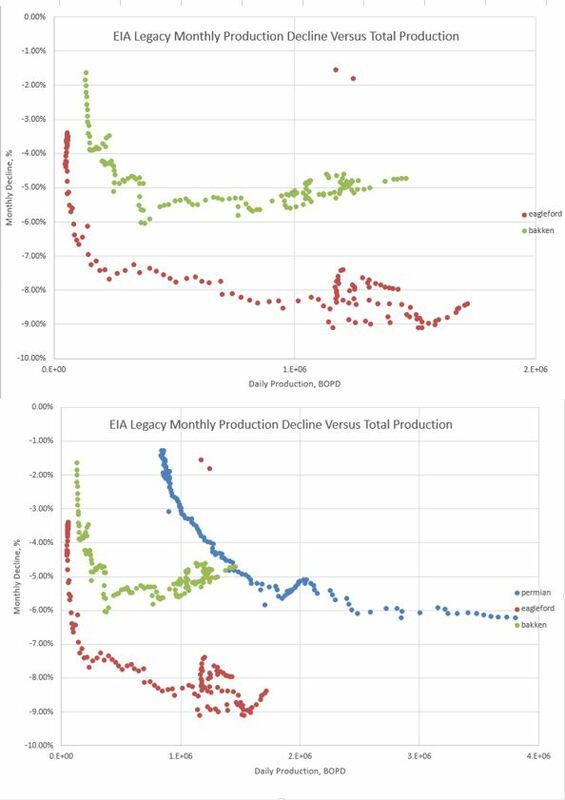 Below is a simple graph of the EIAs estimate of legacy decline in % per month versus total production for the 3 major plays. Enno could probably due a much better job of creating this graph from actual data easily. The differences in my opinion are about GOR GOR GOR and GOR. The conservation of reservoir energy with time. Gas wells drain more acres/ require more acres to drain. By creating an artificial cutoff of 60 b/d, you segregate the lower output wells from the higher output wells. There certainly is a possibility that if you redid your analysis so that you compared the terminal decline of highest quintile of 30 month cumulative output wells with the lowest quintile you might find that the behavior is different for the terminal decline rate. From a statistical perspective, I don’t think picking the low performing wells and simply analyzing those and then assuming this applies to all wells is a good idea. Though no such assumption has been made explicit, it seems to be implied. As I have said before the acceleration in decline is simply a matter of low performing wells being shut in as they reach economic limits. When I take an assumed terminal decline of 10% or 15% or even 20% in an economic analysis the well has to have a net revenue of at least $15,000 per month (assumed average monthly downhole maintenance costs) or the well is shut in (future output is zero). If I created a well profile with an accelerating decline rate (which is likely due to the economic affects outlined above rather than any bubble point of death problem) it would lead to a faulty analysis. 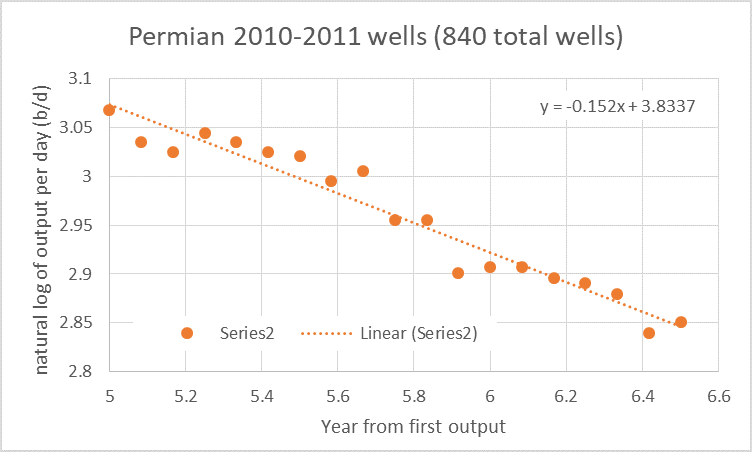 Using last month’s Permian Basin report I created the following for 2011 and 2012 wells, for more recent wells it is unlikely that the average terminal decline rate for the population can be determined in my opinion. Just as choosing the best wells only for an analysis is a mistake (as done in investor presentations) choosing the lower quality wells to determine terminal decline rates might also lead to erroneous conclusions. It would seem Enno has the data to confirm Lapierre’s hypothesis as the GOR might indicate when “bubble point” is reached and that should coincide with a transition from hyperbolic to exponential decline. The very high terminal decline rates (50% or higher) that Lapierre is talking about may only apply to a few wells. I posted the wrong chart, sorry that’s an older chart (also using shale profile data which I did in Nov 2018). Correct chart below 16% terminal decline using all Permian wells which started producing in 2011 and 2012. Here is a problem with using a fixed 60 b/d (or whatever level you choose) for the start of your terminal decline study. Consider a well A with a 10,000 foot lateral and 20 frac stages and x pounds of proppant per foot of lateral and well B with a 5000 foot lateral 10 frack stages and also x pounds of proppant (same type of sand) per foot of lateral. If each of the two wells were drilled in similar areas and depths with similar quality rock we might expect well A to produce about twice as much oil as well B and likewise we would expect the point where terminal decline is reached for each of these wells we might see it occur at a rate for well B that is about one half that of well A. By choosing a single rate for all wells, it is not clear what you are getting, perhaps it would be better to align the start of the study by using some GOR level rather than oil output? Looking at Permian GOR data perhaps use a cutoff of 3.5 Mcf/b for Permian (decline seems to become exponential at roughly 3 to 3.5 for GOR for Permian, the number may be unique for each basin. You make several good points, thanks for sharing your thoughts. I see this as the start for more research on the behavior of wells late in life. Indeed I took a relatively arbitrary cut-off (40 or 60 bo/d), and included all the wells that initially produced above this rate, and then fell below it, before a certain given date. The idea was to analyze how wells at lower rates behave, as this could provide lessons on terminal decline rates, also for wells that haven’t reached those levels yet. The population size was significant, but as you also mention, there are indeed certain biases. To be 100% clear, I don’t suggest that these terminal decline rates I show above, should be applied for the whole population. I do think they are worrisome, and that they may start to negatively impact the average decline rate at some point. It would be interesting to see how these results look like once we take the final (unnatural) drop, from wells that are shut-in for the final time. Also, it would be interesting to see if the decline rates of better wells is indeed so much different than from poorer wells, or that they just have a much better start. I expect it to be a combination of the two, but the results should be enlightening. I plan to come back at these points, and maybe others, in the near future. One of the reasons I start with this was because of the observation in the DJ Basin and in the Eagle Ford that we do see a steepening decline rate for all wells that started in a particular quarter/month, once they reach a low production rate. This could be indeed as simple as just wells shutting in for economic reasons (but I no longer think this is the only explanation). This is by itself already a concern, as many in the industry still assume very long well lives and fat tails. We now start to get data to analyze this in much more depth. To be continued after the NAPE! One way to see if the accelerated decline is due to economics or some other factor would be to only include wells in the analysis that have not been shut in for more than 6 months as such wells may have been temprorarily or permanently abandoned for economic reasons. By filling in those wells output with a zero and then including them in the average one would tend to see a steepening of the decline curve. Based on the data I have seen so far assuming a 15% terminal decline rate gives pretty reasonable results. The overall effect for EUR in changing from a 10% terminal decline to a 15% terminal decline for the average Permian 2016 well is a reduction in EUR from 397 kb to 359 kb, about a 10% reduction in EUR. This only changes breakeven oil price at wellhead from $60.48/b to $61.68/b if a hurdle rate for annual ROI of 10% is assumed. In other words the effect is minor. Also note when doing the breakeven analysis the EUR for the 10% terminal decline well is 380 kb and for the 15% terminal decline well the EUR is 348 kb difference of 8.4%. Shut in output level is 12.5 b/d for the 15% terminal decline well at 13.75 years after first flow and for the 10% terminal decline well output is 12.8 b/d and occurs at 17.3 years after first flow. Excluding wells for the period that they have been plugged or at least been shut-in for 6 months would indeed be a good way to avoid one bias (wells reaching economic limit). Although a 10% reduction in EUR may not have a major effect on breakeven prices, you ignore several other effects, such as the accounting impact involved, or what it means for future supply. Further note that a 10% terminal decline rate is already higher than is commonly used. I agree many analyses use lower terminal decline rates, I have used 10% terminal decline for many years based on the advice of experts who would prefer not be named. Recently another expert suggested even 10% was too low (besides Enno Peters) and based on the whole population of Bakken and Permian wells, especially from 2009 to 2011, it seems that 15% is a more reasonable terminal decline rate. I agree the thinner tail will mean lower future output and my Permian basin scenario now reflects the 15% terminal decline rate. Not sure what the “accounting impact” you refer to is, but I run a discounted cash flow analysis to determine the net present value of future output based on the assumed future oil prices of the scenario. It is assumed that wells are completed only if the net present value of future well output at an annual discount rate of 10% is equal to the full cost of the well (including land, facilities, and decommissioning). However I am not an accountant so may well be missing something. The Permian scenarios I have presented typically do not include the 15% terminal decline assumption, only the breakeven analysis. I agree with Enno that future supply would be lower if terminal decline rates were higher, perhaps significantly. The effect could indeed by huge Dennis. If you assume that a well needs at least 7-10 b/d to be profitable before closed down, higher decline rates imply that you will get to this level a lot sooner. 10 -15 years sooner perhaps? Maybe that could be another thing for Enno to measure. The percentage of well completed in a given year that is closed down / shut in? And the average daily production level the wells get closed down. Definitely interesting questions Alex, which I hope to address in our analytics portal soon. My analysis suggests for the average Permian basin well with first flow in 2016 that at a break even oil price (assuming net present value at an annual discount rate of 10% is equal to well cost) of about $62/b at well head, with a 15% terminal decline rate (annual rate) the well is shut in at about 12.5 b/d and EUR is about 348 kb. For a similar well with 10% annual decline rate assumed for tail, the breakeven price is $61/b, shut in occurs at 12.8 b/d and EUR is 380 kb. So we see about a 10% reduction in EUR. Overall economically recoverable resources might be reduced by up to 20% as fewer wells will be profitable so fewer wells will be completed. Most of this effect will be seen a thinner tail after the peak. There might also be a somewhat lower peak and somewhat earlier. Chart below compares two similar scenarios with different well profiles for the terminal decline (10% vs 15%). 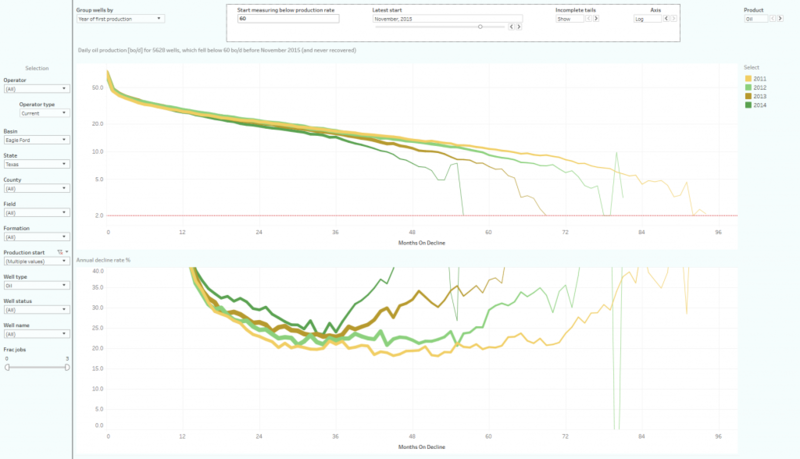 The peak for the 15% terminal decline well profile scenario has a peak that is about 10% lower (7200 vs 8000 kb/d) and a year earlier 2027 vs 2028 compared to a scenario with well profiles with a terminal decline of 10%.